There are only two kinds of elephants left in the world: the African and the slightly smaller Asian elephant. 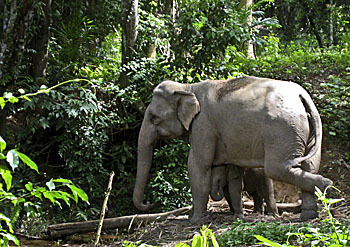 The Asian elephant splits up into three subspecies: the Sumatran, the Indian and the Sri Lankan elephant. 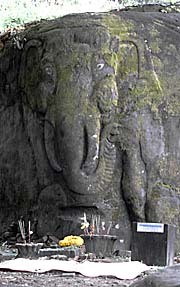 The ones in Indochina, means mainland Southeast Asia, are all Indian elephants. The Asian elephant was once living in the whole southern part of Asia, from Syria to the east of China. Nowadays they are living only in some remote parts of South- and Southeast Asia. Elephants are, as many other species, an endangered one. They are the target of hunting, because their tusks (ivory) are a valuable merchandise. Additionally their habitats are still shrinking due to deforestration, infrastructure projects and urbanization. In the past 100 years, the Asian elephant population has declined by 90%; the extent of their available habitat has shrunk by 95% in the same time. 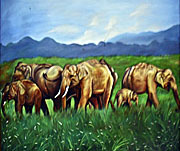 Only 25.000 - 35.000 Asian elephants remain in the wild, down from approximately 200,000 a century ago, in a patchwork of isolated forests. There are also approximately 15.000 Asian elephants living in captivity. At current trends, the Asian elephant could be extinct within the next thirty years." Elephants feed mostly from grass and leaves, also twists, fruit and barks. They need about 150 kilograms food per day. Therefore they don't eat meat. Elephants reach an age of around 65 years. The oldest known one became 85 years old, in the zoo of Taipeh in Taiwan. The big animals, the biggest living on land, live in flocks. The size of the flock depends on the food which the surroundings provide. The flocks are led by an elder (40 or more years old) female. Communication is done by expressing ultrasounds which overcomes long distances. Humans can't hear most of these sounds. Surin in Thailand is a place where a famous elephant festival ('round-up') is hold annually in November. The grand beasts, who lost their jobs as working animals, are now trained to perform funny games for tourists. Busloads of tourists together with loads of Thai schoolkids watch the shows who include elephant football and other games. 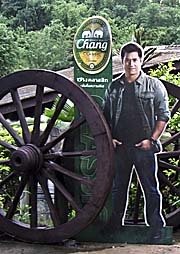 This photograph is displayed in the tower of Mukdahan (Ho Kaeo Mukdahan), Isan, Thailand. 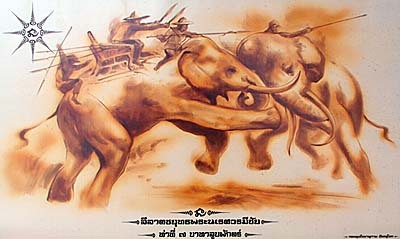 It shows the first Surin elephant round-up in 1955. People used elephants for thousands of years as working animals and for military purposes. Nowadays that's seldom the case, although it's here and there still seen in Southeast Asia. But, mostly they are replaced by tractors, caterpillars and other machinery. Elephants are also kept in zoo's, sometimes taught to perform certain attractions. The keeping of elephants is quite dangerous for humans, it not seldom leads to accidents and attacks, including deadlies. 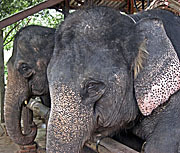 The elephants suffer in many cases a great deal by being kept under bad conditions. Their will is being broken from young age on, they get tortured, humiliated and beaten. The mahout again and again shows them violently who is 'the boss'. Many of the elephants suffer a great anger inside. Elephants, as highly developed and intelligent animals, suffer very much under such deprivations. Traditionally elephants in Thailand are revered animals, representing status and strength. Particularly white elephants have a mystical meaning. Small populations are left in the wild. In Thailand there are estimated 1,500 of the big animals living free, mostly in the border area to Burma, where last larger forests are yet remained; in Cambodia 250 individuals in the Chang (Elephant) Mountains, west Cambodia. Laos counts 1,200, Burma 4,700, Indonesia 3,500, Malaysia 1,600; in the south of China, Yunnan Province, north of the Golden Triangle are 200 individuals left. In India are estimated 18,000 elephants still free, in Sri Lanka 3,500. 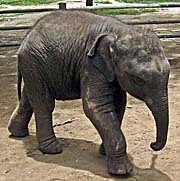 Therefore many former working elephants are still hold in captivity. Becoming 'unemployed' in field, forest and construction work they 'changed' to the service sector in the tourist industries. Poaching is a big problem for the last remaining herds. Ivory carvings and trinklets are in great demand and reach high market prices. Particularly for rich and new-rich Chinese and Vietnamese ivory represents a status symbol. While in the most countries in the world ivory trade is illegal or regulated, it is completely legal in China. It is against the law to sell ivory coming from African elephants (and generall from abroad) in Thailand, but it's legal to sell ivory from domestic Thai elephants. That's a big invitation for laundering African ivory in Thailand. As the WWF recently claimed, there are huge amounts of African ivory sold in Thai shops. The environmental organisation therefore demands the total abolishment of ivory trade in Thailand. On March 4th 2013 started a meeting of 176 representatives of 176 countries in Bangkok (Convention on International Trade in Endangered Species conference, CITES). They discussed global wildlife trade issues, including the elephant poaching crisis. The WWF started an online petition to get a million digital signatures to present them to the Thai primeminister Yingluck Shinawatra in order to abolish ivory trade completely in Thailand. Well, it could contribute to close one of the main markets for the product to protect the African elephant. Until the 4th of March the petition brought 588,000 votes. They are presented to Ms Shinawatra. In a first statement she agreed to close the door for ivory trade in Thailand generally, but she didn't give a timeline. In a speech she claimed, "no one care[s] about elephants more than Thailand". Well, everyone in the audience knew that it is obviously not so. Before the beginning of the conference a number of conservation groups, including the WWF, urged the CITES to punish Thailand for not doing enough to stop illegal ivory trade. The bigger trouble seems to be that China is not on the list of countries to be punished. 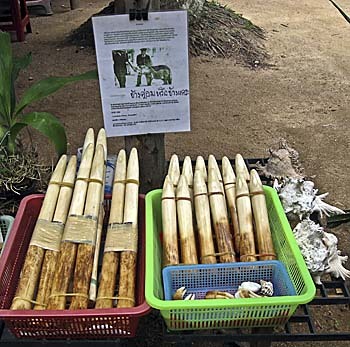 In an article on May 9th, 2014, the 'Neue Zürcher Zeitung' reported of the confiscation of three tons of ivory in the Cambodian port of Sihanoukville. The ivory came on a boat from Malaysia, but it's supposed to be of African origin. Cambodia is as well a transitland for African ivory towards Vietnam and China. By the way: many people believe, elephants would loose their teeths from time to time and they would grow after again. That's wrong. Ivory comes from death elephants or from those whose tusks were cut. In this case they don't grow again. That's actually known since centuries. Even the Chinese envoy of China in Angkor Thom, Zhou Daguan, mentioned that in his report more than 700 years ago.